Would Redrawing the Boundaries of Modern & Contemporary Save the Impressionist and Modern Sales? The May sales in New York raised once again the viability of the Impressionist and Modern markets. The advent of themed sales and, now, the weakness of the Imp-Mod category have begun to suggest a reorganization of the New York sales. Looking back on the overall effect of having only one week of sales in New York in May, the auction houses may find that one week works better than two even if it leaves little room for Imp-Mod works. Judith Benahmou-Huet picked up on this theme in New York and offered another scenario where the boundaries of Modern and Contemporary are redrawn to refresh the first week of sales. 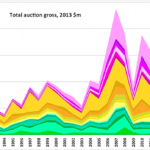 In fact it is partly down to the sales’ structure that the modern art auctions have suffered from a negative perception, especially the allocation of artists between modern and contemporary. Take for instance Alexander Calder, born in 1898, whose works were included in the contemporary auctions. According to the databank Artprice, between 10 and 12 May no fewer than 30 sculptures by the American known for his ‘Mobiles’ were offered for sale and went for as much as $5.7 million.